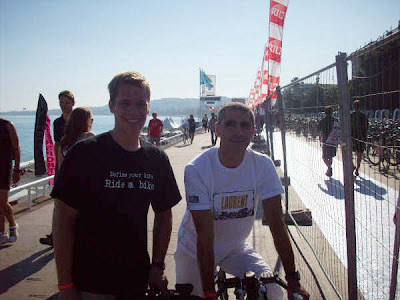 Century Cycles Blog: Kaleb Kaschalk completes Ironman France! Back in March, we reported on Kaleb Kaschalk, who was training to do the Ironman Triathlon in France. Kaleb informed us today that he completed he race. Congratulations, Kaleb! He sent along this photo of him with French racing legend Laurent Jalabert!